Neenah, WI - J. J. Keller & Associates, Inc. and the J. J. Keller Foundation, Inc. are proud to announce the dedication of their 14th home built for Greater Fox Cities Habitat for Humanity. This long-term partnership is benefitting a family with a place they can call home. 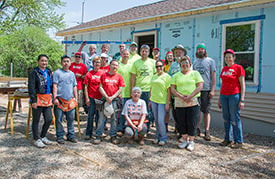 Approximately 135 J. J. Keller associates volunteered and took part in the home build project that began in early April 2017. A dedication ceremony was held on Friday, August 11, 2017, when the keys to the new home were handed over to the deserving family. About J. J. Keller Foundation, Inc. Founded in 1990, the J. J. Keller Foundation, Inc. is a private, family foundation that provides charitable funding to many nonprofit organizations within the local community. Partnering with organizations to change the lives of those in need, the J. J. Keller Foundation has supported several high-impact community collaborations from Green Bay to Oshkosh. These initiatives have addressed children's mental health, providing safe and stable housing, food programs, and a host of other programs that work to meet individuals’ basic needs. JJKellerfoundation.org.